Yesterday, Russia-backed militants violated the ceasefire 10 times, seven and five times respectively in Mariupol, Donetsk, and Luhansk sectors of ATO zone. “No Ukrainian serviceman was killed in action yesterday, but two soldiers sustained wounds,” reported Ukrainian Ministry of Defense spokesman on ATO Colonel Andriy Lysenko at a press briefing at Ukraine Crisis Media Center. In Mariupol sector, Russian proxies continue attacking Pavlopil-Shyrokyne frontline. Moreover, ceasefire violations were recorded in Maryinka and Starohnativka. “The enemy maintains the tactics of simultaneous attacks at several Ukrainian strongholds, but uses no heavy armor,” commented Col. Lysenko. In Donetsk sector, militants twice attacked Zaitseve with armor in the morning. Before midday, Russian proxies violated the ceasefire in Luhanske, and in the evening – in Svitlodarsk, Avdiivka, and Shakhta Butovka position. Ukrainian troops returned fire. 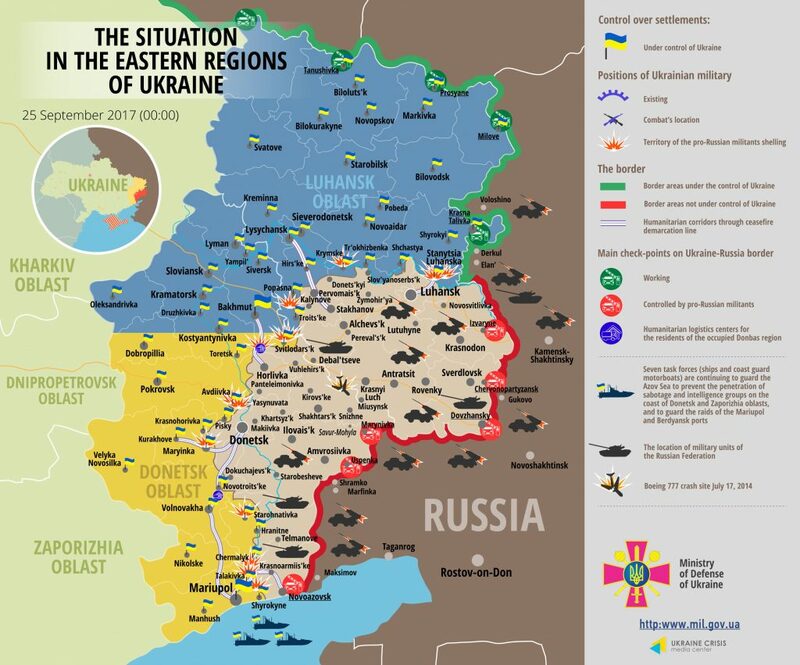 In Luhansk sector, hostilities started after 17:00. “Five firefights between the enemy and our troops took place in Stanytsia Luhanska district, Krymske, and Novozvanizka. Only light weapons were used. Hostile attacks were 15-45 minutes long,” said Col. Lysenko. According to the Ministry of Defense, militants’ losses last week included 11 men killed, 19 wounded, and one Orlan type UAV lost. Report on the military developments as of September 24 is available here. Interactive data on the shelling: chronology shelling chart and the interactive map.